I then rushed off to Bristol Foyles for the launch of the 2012 Bristol Short Story Prize, which is something very close to my heart, not just because I've been a judge for the past two years, but in great part because the prize's organiser, Joe Melia, is truly a tireless champion of short stories and of writers. I am so honoured to be involved (not as a judge this year...). The launch kicked it all off so well - with readings by last year's winner, Emily Bullock (whose winning story, hearing it read by her, stirred me all over again), Bristol-based writer Alan Toyne (unforgettable descriptions of a sweat lodge) and the fabulous Jonathan Pinnock (read my chat with him here), who read two flashes, one of which was new to me, Canine Mathematics - and anything to do with maths always warms my heart! The Bristol Short Story Prize is now well and truly open - get your entries in! Coming up: It's a busy week for me, I have three more events, all part of the new Unputdownable Bristol Festival of Literature: Friday at 6pm at Henleaze Library we'll be finishing off the citywide short story... Saturday 4-5pm at Hooper House Cafe on Stokes Croft I'll be reading together with the excellent Pauline Masurel, Amy C Mason and Jules Hardy... Saturday 7.30-9.30pm at Hamilton House, Stokes Croft, the citywide short story will be revealed... and I'll be revealing how I avoid writer's block! Definitely fiction! I started reading at a very early age, apparently, according to my mother (yes, she does say I was a prodigy, she is my mother) and stories were a big part of my childhood. Science came later, I have vague memories of reading some children's book about Famous Scientists but have no idea when that was. It was at school that I fell for maths (gosh now that sounds odd). I just loved solving equations, loved the right-or-wrongness, the lack of greyness, although now I understand far better that science and the scientific endeavour are full of grey areas. You can read the rest of the interview here. Thanks, Tim! 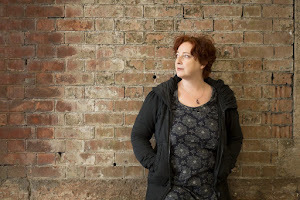 I was delighted to have one of my short short stories, Underground (previously published in PANK a few years ago - scroll down) chosen for their "Underground" themed night on Friday night, where it would be read by an actor. And I was invited to come along (they really like the writers to be there) and listen. Well, I've been to live lit events before, but never one where the tables had proper cake stands filled with tiny homemade cakes, tea cups brimmed with sweeties (yes, gentle reader, I ate them all), and where the chip butties flowed freely! Not only were the readings - by organizers Gareth and Bernadette, actors and writers, and the guest reader, Fiona - excellent, but the atmosphere was wonderful, they constantly made sure that I was okay, since I'd come alone, and supplied with chip butties. After all the readings, we played pass-the-parcel! (Non-Brits, see here for explanation) with prizes! I felt well and truly back in the 1970s, in the best way - especially given the Wombles-themed story that came with soundtrack. I went home with a specially-printed copy of my story in a beautifully-made folder and a White Rabbit memory stick I bought with Gareth and Bernadette reading about 3 hours of stories. 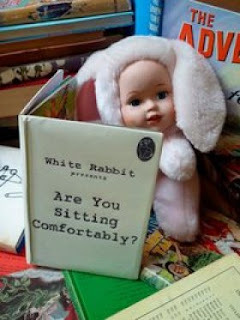 A cracking evening, a delight for writers, a joy for anyone who loves stories and loves being read to - submit for their next themed nights, see The White Rabbit for more. I can't recommend this highly enough, thank you Gareth and Bernadette!